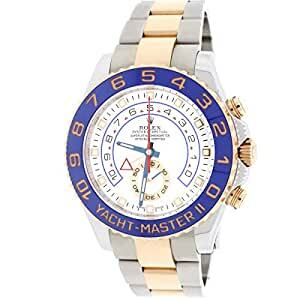 Rolex Yacht-Master II 2-Tone 18K Rose Gold/Stainless Steel AutomaticÂ Mens Watch, 116681. Self-winding Rolex automatic movement. Stainless steel case 44mm in diameter featuring 18K rose gold 90 degree rotatable Command bezel with blue Cerachrom insert. Screw-down crown. Equipped with scratch-resistant sapphire crystal. WhiteÂ dial. Functions: hours, minutes, seconds, and programmable countdown function. Rolex 2-tone 18K rose gold & stainless steel Oyster bracelet.Â The watch is in pristine condition, shows no signs of wear, works flawlessly, and keeping time precisely. Comes complete with Rolex box, original Rolex papers (card), factory instruction booklets, Rolex hangtag, and ElegantSwiss oneÂ year warranty. The watch is running strong and keeping accurate time, having been timed to precision on Witschi Expert Timing Machine.. Buy with confidence knowing each timepiece goes through the same rigorous 31-point inspection. Rest assured only authentic parts straight from the manufacturer are used. The Certified Pre-Owned Program on Amazon ensures peace of mind and transparency via standardized reports and a 1 Year Warranty Provided by WatchFacts.